Written by a prominent scholar in the field, Conrad Phillip Kottak, this concise, student-friendly, current introduction to cultural anthropology carefully balances coverage of core topics and contemporary changes in the field. New to this edition, Connect Anthropology offers a variety of learning tools and activities to make learning more engaging for students and teaching more efficient for instructors. 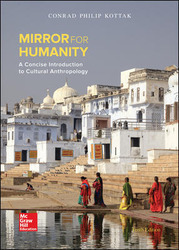 Mirror for Humanity is a perfect match for cultural anthropology courses that use readings or ethnographies along with a main text. New Integrated Coverage of the Impact of Technology and Social Media : Systematic attention is given to the key role of the Internet and social media in today’s globalizing world with new sections like “Resistance via Social Media” when discussing political systems. The Connect Suite effectively engages students in the course so they are better prepared for class, more active in discussion, and achieve better results. Its innovative and adaptive technology addresses a wide variety of student and instructor needs with a rich database of assignable and assessable activities, each attached to a learning objective. Connect Anthropology, part of the Connect Suite, is an integrated assignment and assessment platform that makes learning more engaging and accessible for students and makes teaching easier and more efficient for instructors. Connect Anthropology offers a variety of learning tools and activities, and comes with an interactive eBook with highlighting and note taking functionalities. As part of the Connect Suite, LearnSmart is an adaptive learning program designed to help students learn faster, study smarter, and retain more knowledge for greater success. Millions of students have answered billions of questions in LearnSmart, making it the most widely used study tool that’s proven to strengthen memory recall, retain student attendance, and boost grades. Revisions and updates to the "Anthropology Today" features present new material on global issues (including climate change) and provide greater coverage of these important contemporary issues. Updated charts, tables, and statistics throughout the text represent the most recent findings in the field of anthropology, including the author's own findings from his fieldwork in Madagascar. This concise and affordable program covers the essentials of the field in short, accessible space, allowing professors to incorporate ethnographies in the context of the course. Includes two important chapters not consistently found in other anthropology offerings: "Ethnicity and Race" and "Gender." These and other chapters explore the nature, role, and preservation of human diversity in the face of conquest and globalization. Conrad Phillip Kottak (A.B. Columbia, 1963; Ph.D. Columbia, 1966) is Professor and Chair of Anthropology at the University of Michigan, where he has taught since 1968. In 1991 he was honored for his teaching by the University and the state of Michigan. In 1992 he received an excellence in teaching award from the College of Literature, Sciences, and the Arts of the University of Michigan. Professor Kottak has done fieldwork in cultural anthropology in Brazil (since 1962), Madagascar (since 1966), and the United States. In current research projects, Kottak and his colleagues have investigated the emergence of ecological awareness in Brazil, the social context of deforestation in Madagascar, and popular participation in economic development planning in northeastern Brazil.